I get so many of these fake credit cards and I've been racking my brain trying to figure out what crafty thing I can do with them. 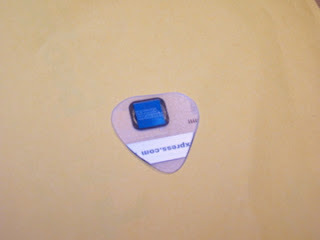 This is the first thing I made: Guitar Picks! All I did was trace a guitar pick on the plastic credit card. Cut it out and sand down all the sides till they are smooth. Send a bunch to your environmental, guitar strumming pal for the holidays.